Order a John Deere 3036E value line compact tractor at SALTEX 2015 and get a dedicated D160 front loader worth nearly £3000, with a lift capacity of over half a tonne, for just £1. The 36hp 3036E 4WD open station tractor uses an established two-range hydrostatic transmission with easy to operate Twin Touch pedal controls, while ergonomics and operator comfort are the equal of premium models. Standard features including power steering, cruise control, wet disc brakes, a rear 540rpm pto and three-point linkage with up to 615kg lift capacity. John Deere is represented at the show by regional dealers Farol, Henton & Chattell, Tallis Amos Group (TAG) and Turner Groundscare. 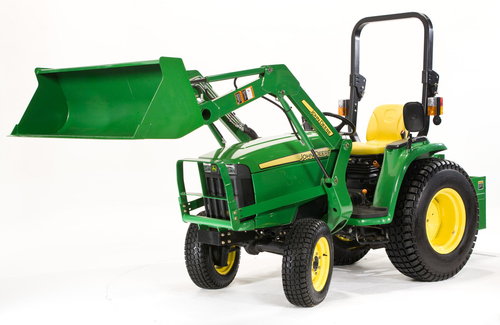 The joint display on Stand E080 also features models from the company’s comprehensive range of commercial ride-on and walk-behind mowers, compact tractors and Gator utility vehicles. New machines on show include the X950R rear-discharge diesel lawn tractor with mid-mounted mower deck and rear high-tip collector, a 1580 TerrainCut outfront rotary mower and John Deere’s biggest zero-turn mower, the ZTrak Z997R, alongside a 3045R mid-chassis compact utility tractor equipped with an AutoConnect drive-over mower deck. With high capacity cutting decks stamped from thick steel, exceptional manoeuvrability, versatile heavy-duty transmissions and productivity enhancing ergonomics and operator comfort, John Deere commercial mowing equipment offers a complete range of solutions to groundsmen, greenkeepers, landscapers, contractors, local authorities and other amenity and turf professionals. Additional attachments such as a front-mounted brush or blade allow individual machines to be used year round for other commercial applications, including both leaf and snow clearance. Other John Deere commercial machines on show at SALTEX 2015 include a TH 6x4 Gator, PRO 47V, C43 and JX90CB walk-behind mowers and the D45C scarifier.